The Glove Keeper's many benefits resolve all the frustrations Firefighter's have expressed with Velcro holders. 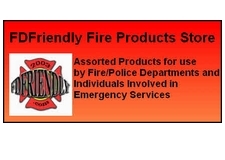 Quickly place any size Firefighter's or rescue gloves through the loop and cinch it tight. You will never lose your gloves, and will even have room in the holder to hang your Nomex hood. The Glove Keeper has a split ring that attaches to any D-Ring on your gear, and an extremely durable utility clip is included for those styles of turnout gear where D-Rings are not included. A small safety ring will break apart at approximately 65 lbs. of pressure to ensure your safety while in a structure, and the Glove Keeper is rated to 421 degrees Fahrenheit so that it will take the heat.